If you yearn to explore the Colorado outdoors, but are hesitant to wander the wide blue yonder on your own, consider hiring an adventure guide to show you the way. Here we’ve gathered a list of popular expeditions offered by Colorado adventure guides for beginner to intermediate travelers to get you started on your journey, whether you're looking for family-friendly trips or vigorous exercise and adventure. There’s no better way to explore Colorado’s wild backcountry than under the wing of a trained guide who not only knows the ins and outs of trails, but can also give you insight on the area’s history — and feed you after a long day of high-altitude mountaineering. Meals and equipment are usually included in the cost of the excursion, and trips can be customized to your ability or to help you reach a personal goal. The Trip: Explore the last 94 miles of the Colorado Trail, which spans 500 miles from Denver to Durango (Segments 24 to 28); the number of trail segments you cover depends on how many days you choose to hike. Highlights include the vast Weminuche Wilderness, the jaw-dropping amphitheater below Blackhawk Pass, the lush and remote Cascade Creek drainage and the rugged La Plata Mountains. 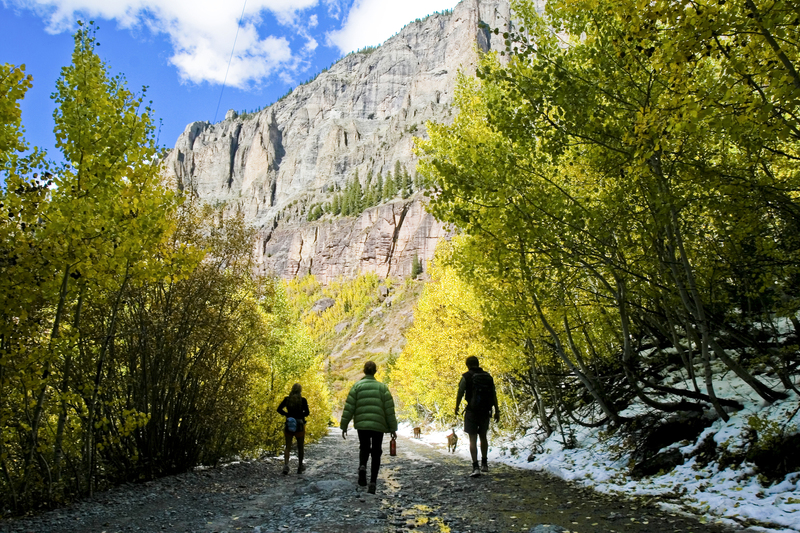 Learn more about hiking the Colorado Trail. The Trip: Start on the western border of Rocky Mountain National Park outside of Grand Lake and hop on the Continental Divide Trail. You’ll intersect flower and wildlife-freckled meadows, tumbling waterfalls and clear alpine lakes — all surrounded by a sea of peaks and the comfort of a seasoned guide, who fill you in on little-known secrets about the area. If the typical half-day rafting trip doesn’t leave you with enough time on the water, spend multiple days riding Colorado’s rivers with the pros. From slow floats to Class V white water levels, rafting guides coordinate trips for all types of paddlers and provide perks like freshly prepared meals and campfires. The Trip: Dvorak Expeditions hosts a variety of fishing and whitewater rafting excursions. This trip takes crews for 23 to 65 miles among Class II rapids (Class III during high water levels) on the Colorado River. Alpine scenery, historic points and milder whitewaters make the Colorado River — Little Gore Canyon expedition ideal for families. The Trip: Choose from a variety of trips, from family to adventure-class outings; expeditions are tailored to match groups' needs. After an exciting day on the rapids, you’ll enjoy a freshly prepared meal, an evening campfire and riverside sleeping arrangements. Yampa River Rafting by O.A.R.S. The Trip: In addition to rafting among Class III rapids through majestic Dinosaur National Monument, guides take adventurers on multiple hikes and offer insight into the area’s rich geologic and native history. The Trip: Spend two days challenging Class I, III, IV and V rapids in the Upper Animas River Canyon between Durango and Silverton, and one day fishing, hiking or relaxing in the Weminuche Wilderness. Other highlights include cruising the Million Dollar Highway via shuttle to Silverton, access to an established campsite and hearty meals. The Trip: This one-day activities package will get your adrenaline pumping and introduce you to the breathtaking beauty of the Cañon City area. Conquer rapids on the Arkansas River below the Royal Gorge, the iconic 1,200-foot canyon; and view the landscape from new heights on helicopter and ziplining excursions. View complete listings for Colorado rafting guides. Colorado has hundreds of rewarding rock climbs. Multi-day trips offer an introduction to the vertical world for beginners and excursions customized to your skill level (be honest!). Gear is usually included, and guides/instructors help you build a solid foundation of skills to become capable rock climber. The Trip: Reconnect with family members or friends while you refine or acquire new rock-climbing skills and immerse yourselves in the Vail-area backcountry. Understand how protection systems work, learn the dynamics of rope handling and develop a sense for moving comfortably on the rocks. Top-roped climbing for beginners and lead-climbing instruction is also available. The Trip: Whether you’re first-timer or an experienced climber, Apex Mountain School has full-day programs for every age, ability and fitness level. Select a climbing area in Vail, Beaver Creek, Breckenridge and Boulder’s Flatirons, or select a course that focuses on skills like multi-pitch climbing or rappelling. Find more rock climbing guides in Colorado. If you prefer to embark on two-wheeled adventures, Colorado bike tour guides have invaluable knowledge of trails and their surroundings to provide you with a less stressful and more in-depth riding experience. Additionally, guides are trained to evaluate trail and weather conditions as well as rider ability to ensure riders avoid accidents for the safest ride possible. The Trip: Bike through Colorado history as you pedal up an old railroad grade from St. Elmo, one of Colorado best-preserved ghost towns, to the old mining towns of Romley and Hancock. In Hancock, you’ll ride up the famous Alpine Tunnel railroad grade, a line that was closed in 1910 and now delivers a beautiful, high-mountain bike ride encased by jagged peaks. The Trip: You don’t have to be an adept biker to have a National Geographic-caliber cycling experience. Try this 26-mile, all-downhill excursion from Trail Ridge Road to Estes Park. The trip includes a stop in Horseshoe Park for a snack before the 7-mile descent on downhill and flat terrain to Estes Park. View complete listings for mountain biking guides in Colorado. Included: Friendly guidance from an experienced trip planner, personalized Adventure Kit trip portfolio, first night accommodation in a three- or four-star hotel in your gateway city, rental of a deluxe recreational vehicle (sized to fit your group) and nightly reservations in carefully chosen campgrounds in or around the national parks. The Trip: For these customized Colorado road trips, Tracks & Trails does all the planning, while you and your family do the driving. Travel at your own place in a rented RV to destinations, including Rocky Mountain National Park, Leadville, Glenwood Springs, Redstone/Marble and Denver. At each location, detailed directions will lead you areas reserved for you to park and activities provided by trusted outfitters. The Trip: Dvorak Expeditions will coordinate a Arkansas River Valley activity to please every member of your family. Sign up for activities such as horseback riding, hiking, rafting, fly-fishing, rock climbing or fourteener climbs in the Collegiate Mountain Range. Then, spend the evening reminiscing about your exploits at a riverside campsite or nearby bed and breakfast. Climbing one of Colorado’s 58 fourteeners earns you true bragging rights, but the achievement does not come without careful preparation. Take the guesswork out of your journey by following a guide, who will help you predict storms and changing mountain weather. Guides can also chart the best trail up a peak for your abilities and help keep you hydrated and in tune with difficulties that come with high-altitude exertion. The Trip: These all-day guided adventures call for an early morning start and involve off-trail hiking in uneven and rocky terrain. Summit the 14,005-foot Mount of the Holy Cross, a peak in Sawatch Range named for the distinctive cross-shaped snowfield on its northeast face. You can also choose a smaller 12,000-foot-plus climb such as Grand Traverse Peak, Homestake Peak or Mt. Jackson. There are so many ways to explore our great outdoors — why choose just one? Many adventure guides offer packages that include multiple ways to experience Colorado’s iconic landscape. Read on for a few suggestions. The Trip: Gain an intimate taste of the central Rocky Mountains by partaking in three quintessential Colorado activities: horseback riding, whitewater rafting and relaxing in natural hot springs. Explore the picturesque cities of Carbondale and Redstone; sleep in a private cabin and melt away your worries at Avalanche Hot Springs. Learn more about Colorado hot springs. While backcountry slopes can stimulate dreams of pristine, untouched powder and tranquil landscapes, navigating off-the-grid territory can be daunting. During these guided winter excursions, experts provide avalanche gear and training and help you navigate Colorado’s best backcountry routes for skiing and snowboarding. The Trip: Paragon Guides utilizes 16 huts in the 10th Mountain Division Hut System and skiing routes between Aspen, Eagle, Vail and Leadville. You can design your getaway around routes thatallow you to stay in a single hut for one to three nights, or ski/snowboard from hut to hut (mileage between huts varies from 3 to 9 miles) for a more extensive trip. The Trip: Set off on a ski tour in the Elk Mountains outside of Aspen with an out-of-the-way hut as your base. Huts are equipped with solar power, wood stoves, grub and sleeping bags, so all you have to do is ski in and enjoy. Read more about Colorado hut trips for cross-country skiing & snowshoeing. The Trip: Hike up a peak in the San Juan Mountains to experience the reward of an unforgettable 3,000- to 5,000-foot descent down the mountain on your skis. Possible peaks include North Twilight Peak, The Grand Turk, Sultan Mountain, Bear Mountain, Kendall Mountain, North and South Lookout Peaks, The Battleship, Mt. Sneffels and Chicago Basin fourteeners.